To overcome these deficiencies, pellets and extruded diets have been developed to provide balanced nutrition. Seeds, minerals, and vitamins are ground to mostly homogenous mixture, and then processed into a pellet. This process makes it difficult or impossible for a bird to pick out and eat favorite parts and leave other parts behind. The homogenous food thus helps to ensure that the bird consumes a balanced diet. However, pellets and extruded diets, because of their uniform texture, do not offer much foraging enrichment and environment stimulation. Some seed products include a pellet in the mixture to balance the entire product. This requires that the bird eat those pellets along with the seed to receive the balanced meal. Most often, birds do not eat the pellet in this type of product. Another variation is to coat the seed mix with vitamins and minerals to balance it. The coatings are often colored and are applied to the seed hull; however, the vitamin and mineral intake from the coatings is removed when the bird de-hulls the seeds. 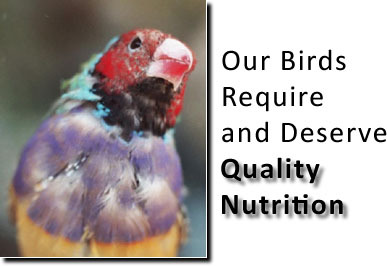 There are several ways to be sure that your birds get the proper nutrition and that is to use an expertly formulated avian multivitamin supplements like Dr. Rob Marshall's Dufo and Ioford or Morning Bird's Hearty Bird. 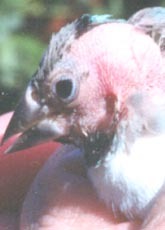 Calcium deficiency is even a bigger problem for birds than Vitamin A deficiency. Most owners give their birds cuttlefish bone for their calcium requirements. Most of the cuttlefish eaten goes straight out into the droppings. Calcium is very hard to dissolve inside the gut. The finest calcium solution is Calcium Plus. It is easily absorbed and quickly gets to the bones, nerves and muscles where it is needed. 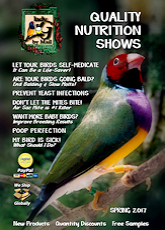 Calcium Plus is only needed once a week (twice for African Greys and Eclectus) in non breeding season. You would be amazed how many birds are suffering from inadequate calcium intake. Behavioral problems, droopy wings, fluffed appearance, poor perching and clumsy flying, shaking, fear, aggression, self mutilation and difficulty laying an egg are all indicators of calcium problems. If you are in doubt, use extra Calcium Plus five days a week for a month. Hens require extra calcium to make good quality egg shells. Most birds only carry enough calcium stored in their bones to produce three eggs. Calcium Plus provides calcium, D3 and Magnesium to ensure healthier hens, producing larger clutches with better hatchability, producing more live chicks! During the breeding season increase Calcium Plus to three to five times a week. Twenty percent is a fair rule of thumb. If we increase the protein level of the diet, this sends a message to the adult birds that raising chicks is likely to be a good prospect. To achieve this, simply add Breeders Blend to Miracle Meal soft food or on fruit and vegetables. Breeders Blend is a very high (80%) protein supplement that has worked wonders for both fertility, chick growth and feather quality. During breeding season rapidly growing young chicks require a lot of protein for good growth. Sulphur and sulphur-containing amino acids are present in feathers in very large quantities. Traditional cage bird diets contain too few of these crucial nutrients. The result is slow molting and, for some vulnerable species, death during stressful molts. Slow or continuously molting birds should be supplemented with Feather Fast and Calcium Plus. Feather Fast is a comprehensive vitamin, mineral, limiting amino acid and balanced protein supplement. The vital amino acids are very smelly in water so this system is for supplementing fresh fruits and veggies, egg or softfoods. 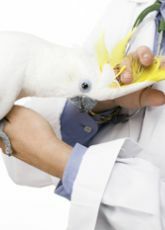 Quick-Gel, Thrive, Vitalize, NV Powder, Herb Salad™, ER Formula and Probiotics are all strongly recommended if your bird has been on a course of antibiotics. Birds that are even less well may still be eating but may have difficulty digesting their food. These birds need a food that is very easily absorbed. Herb Salad™ should be available to your bird at all time. The fundamental principal behind Herb Salad™, is in the way it gives your bird the power of choice. The benefit of regular access to the healthy bird is in permitting them the opportunity to address health issues, vitamin deficiencies and illness before the onset of the changed behavior or eating patterns that alert us to a health concern. The merits of early prevention can be crucial for breeding hens and babies, as well as the smaller and more delicate specie. Stressed and recovering birds also profit from the constant availability of Herb Salad™ with it many function-specific herbs. While not all bird nutrition experts agree that enough credible studies have been conducted to scientifically determine the dietary requirements for most species of birds, others argue that a one-size-fits-all feeding program isn't the answer either. There are just too many different kinds of birds out there to lump them all together. African greys can show up with calcium deficiency when fed just a diet of seeds. Lories eat entirely different than Amazons. Amazons seem to get fat easily, so they need fewer calories than a cockatoo. And there are species of macaws that need more fat than most big birds. The small birds eat entirely different than the big birds. They just all have very different needs. As the single most important factor in maintaining avian health, vitality and longevity, nutrition can literally mean the difference between life and death. Malnutrition, the leading cause of disease and early death in birds, is a human-created problem that can be prevented through proper nutrition. By understanding your species-specific avian nutrition requirements you can supply, seeds, pellets, fruits, vegetables, softfoods, herbs and seasonal supplements that will provide the proper, balanced diets for a Healthy and Happier bird!